With over a million products already sold by the tech-giant Apple, it is time for them to unleash the new beast. Say hello to the new iPhone 7 and the iPhone 7 Plus! We live in a time where we are heavily dependent on technology. Compare to what we used to have a few years back and we can feel the difference. Both the Apple iPhone 7 and the 7 Plus are one of the most technologically advanced phones in the market right now. It comes with the Apple A10 processor, which makes it 30% more efficient than its predecessor. A new dual configuration camera has been a significant improvement over the last year’s 12MP shooter. What makes it even cooler that it is now officially water resistant! Apple has removed the headphone jack which some may consider as an unwise decision. One of the most interesting features of the new iPhone is the 3D touch that allows the users to do a lot more with their device. First introduced in the 6S, it did not turn out to be a huge success. Well now, you can access shortcuts a lot easier depending on how much pressure you apply on the screen. With the new ios 10, 3D touch becomes useful in so many ways but one should better have some tricks up their sleeves to make the most out of their devices. Using a series of electrodes, pressure is detected and is sent to the “Taptic Engine.” After processing the information, a haptic feedback relays information back to the user. Apple’s ios was always user friendly but in order to stay organized, the user had to do touch and hold the app icon to move or delete the app. With the new 3D touch in offering, here’s how you can delete or move applications in the new iPhone 7 and the 7 Plus. Touch and hold now reveals a small pop-up displaying the supported shortcuts of the app. For example, long-pressing the twitter app icon now pops up the options search, new tweet, new message and share via twitter. So now what? How to delete or move an app? Use the similar “touch and hold” feature but do not apply any pressure on the screen. Just hold on the app with the lightest touch possible and the familiar “jiggling apps” will appear on the Home Screen. 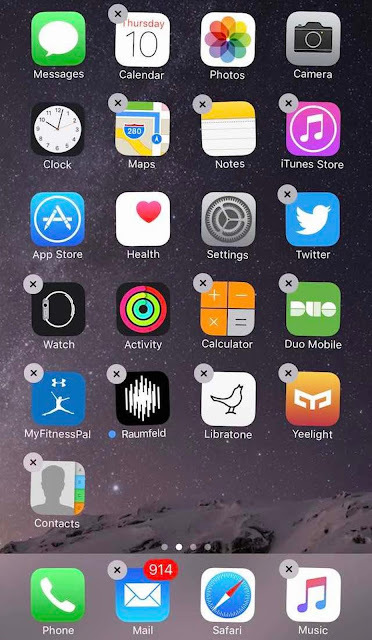 You can now move or delete apps at your will. Well, was it necessary? With all the additional hardware and software, it doesn’t come cheap. We know Apple for their brilliant engineering and amazing devices over the years and they have never failed to surprise us. This was a major addition to the new iPhone this year and yes, we love it. It takes kind of getting used to it but once familiar with this piece of technology, it’s a breeze. Organizing your apps was never so convenient and the 3D touch aids to it.